SXSW® GO, presented by Showtime, is the official mobile app for getting the most out of attending SXSW 2019. 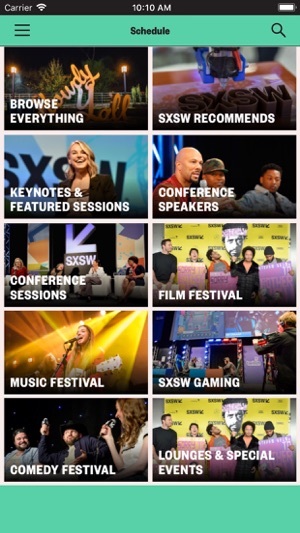 With SXSW GO, you can upload your badge photo, get personalized recommendations, build your schedule, network with other attendees, request SXXpress Passes, see real-time event status and more! Sign in with your SXSW credentials to unlock these features. SXSW Recommends – Personalized event and attendee recommendations based on a variety of factors, including favorited events, favorited attendees, time and location. Abby, the SXSW chatbot– Casual, fun conversational-style user experience and an easy to follow guided menu to help navigate SXSW, find out what’s happening, and get timely answers to FAQs. Event Status – Check the current status of an event’s real-time popularity for conference sessions and festival events. Events will have a Green-Yellow-Red status on the day of the event to help you make any last minute decisions. Favorited By – See how many people have starred any session, showcase, or screening. Not only will you be able to see how many people favorited an event, you can also see who! Schedule - Browse the entire SXSW 2019 schedule and plan your week. Watch Film trailers, listen to Artist’s tracks, learn more about Session speakers. Star events as My Favorites and easily sync your favorites between devices. Networking - Search the directory for other Attendees and quickly send direct messages. 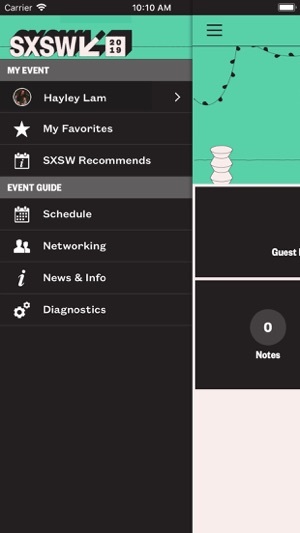 Boost your networking with personalized recommendations from SXSW Recommends. Opt in to location services to see who’s around you. Exhibitors - Browse the Exhibitor directory for all exhibitions, including SXSW Art Program, Gaming Expo, SXSW Marketplace, Virtual Cinema, Flatstock, Startup Spotlight, Trade Show, and Wellness Expo. Use maps to easily navigate the exhibit halls. SXSW GO 2019 is presented by Showtime and powered by Eventbase. -Abby the SXSW chatbot delivers inline recommendations. Favorite events and build your schedule directly from Abby’s conversational UI. 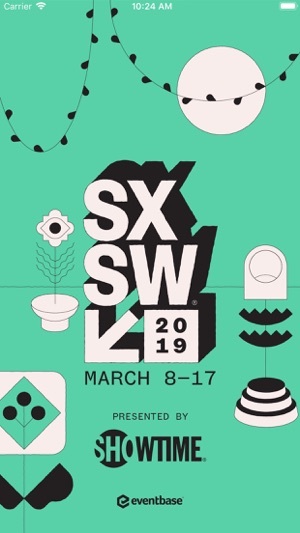 -The SXSW Recommends algorithm has been optimized for the 2019 event with machine learning! Get personalized recommendations and opt in to notifications for real-time recommendations. 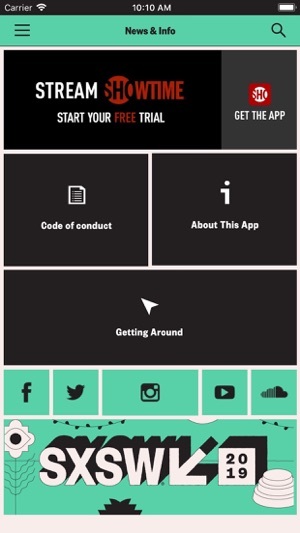 This app is useful. It’s easier to access than the web schedule. Although the functionality is limited (hard to scroll, slow response, can’t search by location) it’s actually one of the best conference apps since most conference apps are horrible. When you’re browsing the schedule, there’s a non-skippable banner ad with 15-20% of the screen. Again for showtime. With the other navigation wrapper, this means you can only see 3-4 items and scrolling is jerky. This means when you swipe you go past where you want. This conference is paid. I understand trying to get some ad revenue, but it’s worsening your user experience. Comically, there are dozens of sessions with great designers about design. There’s probably some SXSW employee weeping at having to sacrifice design principles for the release of this app. I would prefer just a giant pdf and text search (not available). Oh yeah, the capacity feature is neat, but not very accurate or useful. Although I don’t think this is a flaw in the app. Likely the data capture and estimate. Thank you so much for your detailed feedback. We are always looking for ways to improve our app. I will take this feedback to our mobile dev team. If you have any additional thoughts we would be happy to hear them. Please let us know more at mobiledev@sxsw.com. But it frustrating to use a frustrating amount of the time, specially for a conference that is supposed to be for interactives, I’d expect better execution! Scrolling the list is constantly wonky, going into a detail page and then back to the list you loose your place, or events show up multiple times - creating an infinite scroll affect. If you’re playing audio in the app, the layering makes some of it unusable. When loading detail pages sometimes it crashes out within the app and the detail page goes away and returns me back to the start of the app, loosing my place and forcing me to search again. The express pass is a nice idea, but I only got it to work once after being there for a week and trying at 9am the day prior as instructed. 1. The red/yellow/green indicators don’t help. 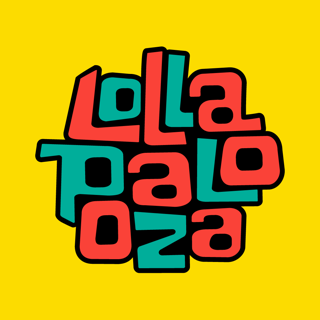 The event staff controlling the door/line for each session should really be able to manually change the indicator to yellow & red based on the line ups they are seeing before a session starts. If I see a green indicator 20min before a session and run across downtown to get there only to find there is a line up equal to double the room capacity - that’s a serious failure in communication. If the door staff had changed it to red when they knew the rooms capacity was lined up in the hall, then I would know it wasn’t worth hustling across town to try and make it. 2. The location services really need to include maps inside each building showing where the rooms are. And it also needs step by step navigation / direction so the people can quickly find the rooms they are seeking.